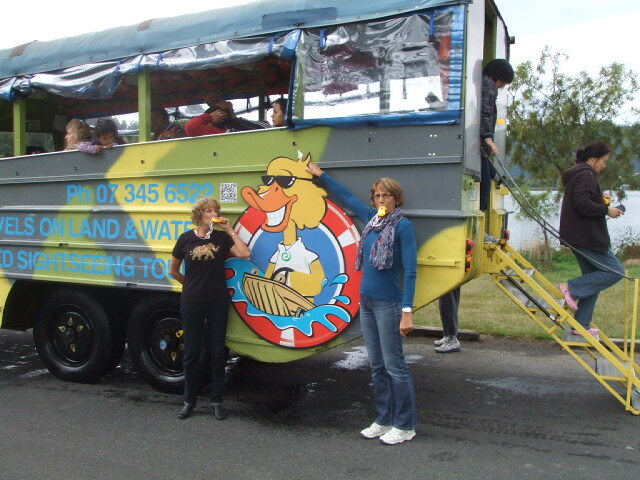 Rotorua Duck Tours are a fun way to delve into Rotorua's history, learn about the WWII amphibious 'duck' craft and ride the highway and lakes - in the same said craft. You can make people smile too, if not laugh right out loud. How? By blowing on a silly little duck quacker as you pass by. Yes, this is what I willingly, make that semi-willingly, signed up for. My best tip? Be prepared to enter into the spirit of the occasion with the 'Conducktor'. This is what makes the experience in my view. The Conducktors go out of their way to show people a good time with light-hearted banter mixed up with factual information. The tour that I took part in was 90mins in duration and it's amazing how fast it went. The other one is 2hrs. 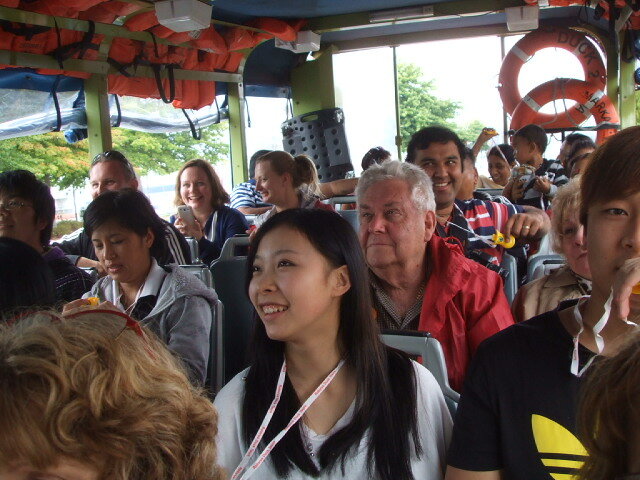 Happy Rotorua Duck Tour passengers - mostly - representative of various nationalities. 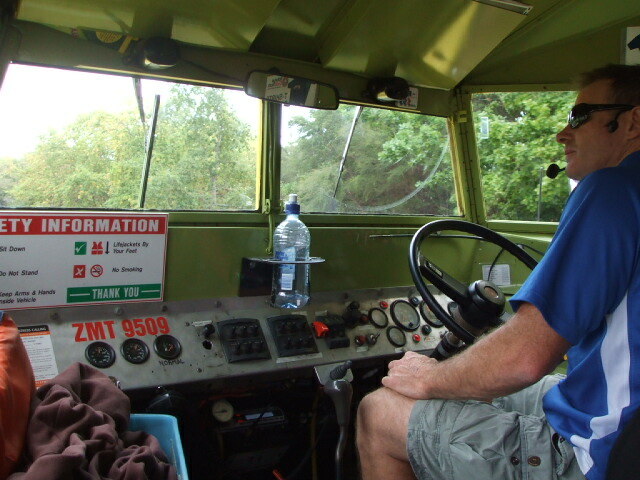 I can't say Rotorua's Duck Tours were high on my list of things to do here. I've always thought, ho hum, riding around in a big yellow bus thingy, how exciting is that? I was, in fact, pleasantly surprised. It's one of those things where you can let go of the reins for a bit, be silly, and not worry about how you're supposed to look and act. I wouldn't call it exciting but I would say it's fun. At least for myself and my friend it was. Everyone else seemed to have fun on this tour as well if the amount of laughter going on was a gauge. And it's uber cool, how can it not be when the wind is whipping through your hair when hooning along the road at 30km or less huh? I'm being cheeky here because the Rotorua duck does not go 'fast' as we know it. It doesn't matter how old or young you are, this is an activity that everyone can enjoy. It's fun, very informative and the scenery can be spectacular. 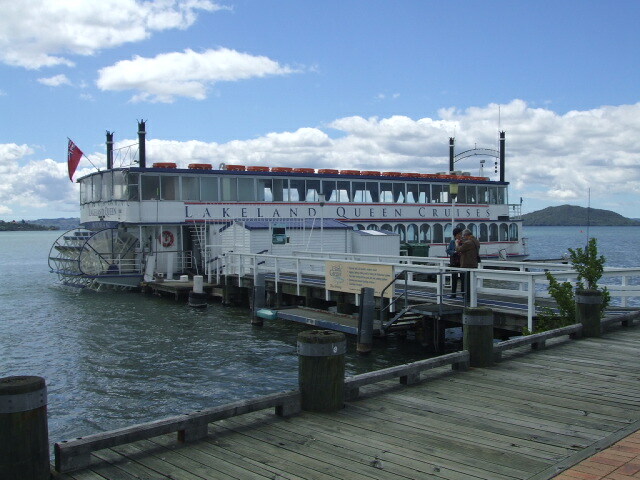 This tour takes in three lakes with splashdown by the Duck in two. 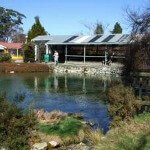 Rotorua sights include Lake Rotorua, Mokoia Island, Sulphur Point, Government Gardens, Rotorua Museum of Art & History, the Blue Lake (Tikitapu) and Lake Okareka. This tour runs for seven months of the year. 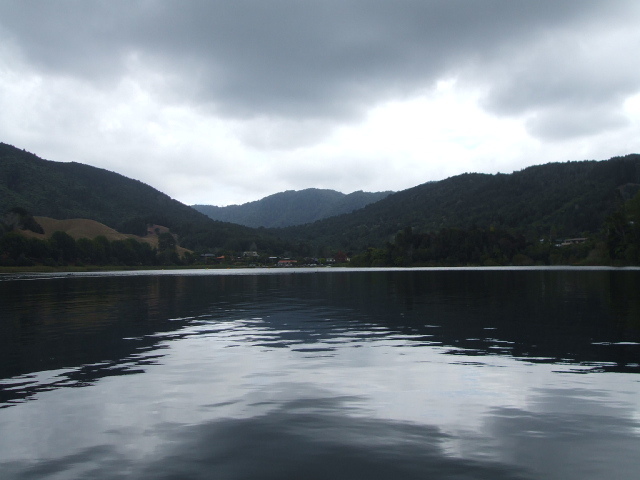 It takes in four of our lakes with splashdown in three: Lake Okareka, the Green Lake (Rotokakahi), Lake Tarawera and the Blue Lake (Tikitapu). Apparently this tour focuses on the history of the coming of the māori and our legends plus the history of tourism in this area. Our Rotorua Duck Conducktor, Peter. Rotorua Duck Tours depart from the Rotorua iSite information centre located at 1167 Fenton St and return here too. See Google map below. Metered parking surrounds the iSite area so put in enough coins for 2hrs or 2h 30m if on the longer tour. I think the meters are NZ$1 per hour, some parts of the city are $2 per hour. 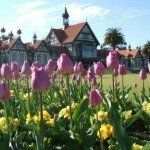 You can park for free in the Government Gardens. Make sure to take warm clothing along as it can get cold on the lakes. Booking in advance is advisable as seats do fill up, then pay on the day using cash, credit/eft-pos cards on the duck itself. Otherwise book and pay online. Don't forget to take your camera... and make sure it has a good strap, you don't want to be dropping it in the lake because sure as eggs, you'll be wanting to hang out the window to take photos. PS. You get to keep the quacker. Duck tours run daily apart from Christmas Day.